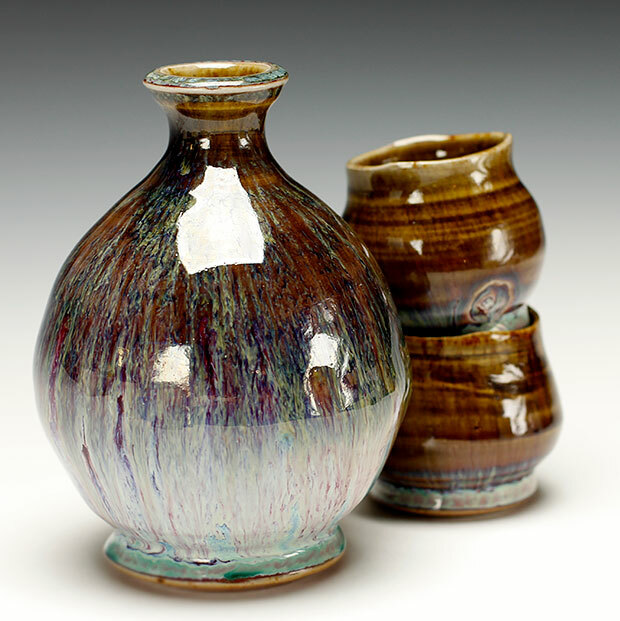 wood fired stoneware, multiple glazes. I was, perhaps, a 'late-bloomer' with respect to my interest in clay: my first whiff of "passion" for this media did not reach my senses until midway through my sophomore year at Goshen College. But what started as a single "elective" in my academic schedule, grew into a "mild interest" as I orchestrated three more clay classes into my already-full academic schedule, over the course of my final two years of college study. After college, I began a "regular job" (in administration), but maintained a haunting attraction to clay—pursuing it only as a hobby in a 10' x 16' chicken house that I had remodeled into a tiny ceramic studio. My kiln was a wood-fired cross-draft kiln—not because I had any real comprehension of a wood-fired aesthetic, but because I had a free source of wood fuel, and was too poor to afford even the down-payment on a propane tank. Five years of this hobbiest approach to clay continued as I pursued my career in administration, and spent three years in graduate school (in a field quite apart from clay pursuits). In 1981, it finally became clear to me that what I most needed to do with my life, was to pursue this passion with clay which had first infected my life back in 1974. My full-time work in clay, since 1981, has always included a comprehensive retail studio that has been open to the public six days each week. I have loved the idea of making pots of utility and function that grace and bless the lives of users, making common moments special and memorable. I continue to make works of utility: the functional production items in my catalog number nearly 100. 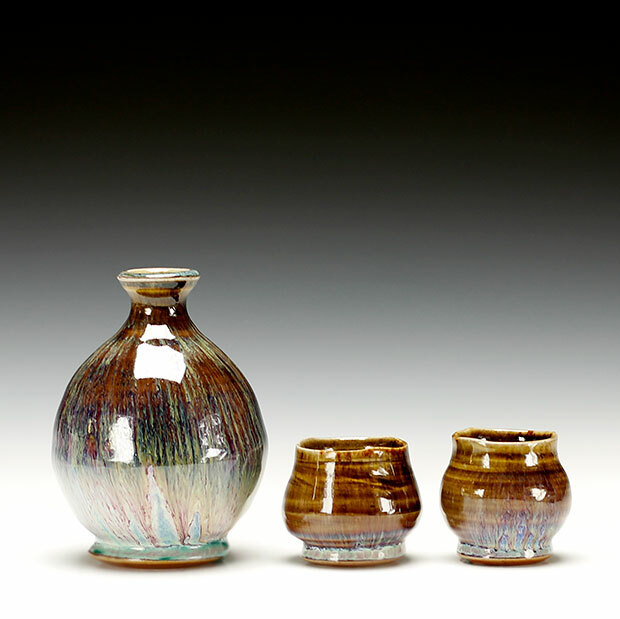 And the studio now employs at least three other potters who assist in the production of these studio 'repeat-ware' items, while at the same time providing an opportunity for them to mature in their own careers and professionalism. But during all these years, I have always made time for the pursuit of works that explore new ways of working with clay—always working and discovering within the context of my peculiar set of limitations. I have consistently structured-in time for experimentation, sabbatical refreshment, and education. The outcome of these years of exploration and development has resulted in the saggar-fired, side-fired and wood-fired approaches that constitute the "exhibition-quality" works that I produce. Not having abandoned my commitments to utility, these exhibition works explore ways of working which are more risky, less predictable, and perhaps more inventive than my regular production works. These works, for 30 years, have been sold primarily through my retail studio. 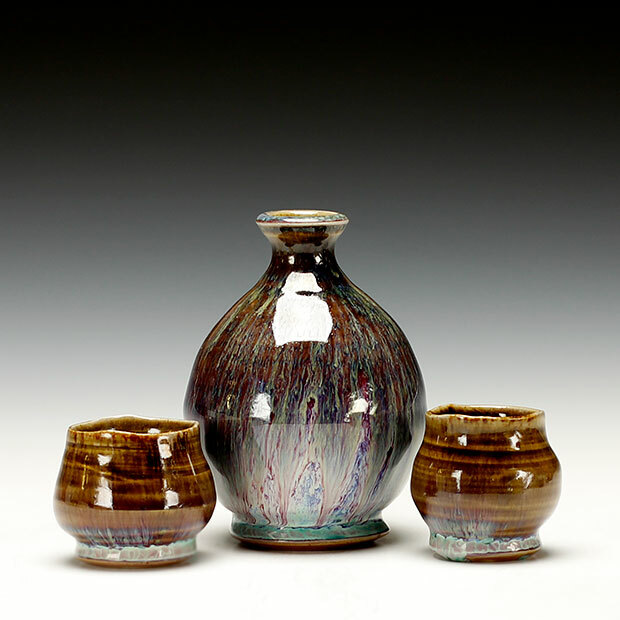 During the last twenty years my life has been graced by the support, nurture, and mentoring of many potters. Over the last ten years I have had the opportunity to travel internationally, to offer more than 45 workshops, to work as visiting artist in academic settings, and to author nearly 50 articles for international ceramics publications. And as always, these remain my best hopes: that as I continue to nurture my own development, and attempt to be generative with my sharing, that others will find some merit and some benefit in these offerings.